Katahdin and Moosehead Maine is an ideal place for your outdoor adventure. Mount Katahdin is one of the top destinations for hikers and backpackers. This is where the Appalachian trail starts, winding its way through Maine, New Hampshire, and down the Eastern Seaboard to Georgia. There are many mountains around Moosehead Lake that give spectacular views of the lake and the region. Please share your Maine hiking comments. To feature your business, contact us. A wilderness of more than 200,000 acres, Baxter State Park is a hiking and mountain climbing paradise. Within the park borders are 46 mountains, 175 miles of hiking trails, and 10 public campgrounds. 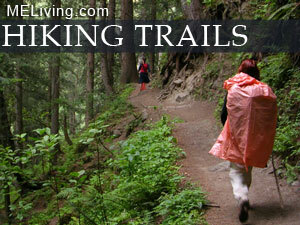 Your starting level is 600 feet and the trails rise extremely quick, about 2,00 feet every 2 miles. Baxter is also the northern end of the Appalachian Trail. Wintertime offers both cross-country ski trails, snowshoeing, winter hiking, and limited snowmobiling. This unusual natural formation is a deep slate canyon. Accessible only by trail, the Pleasant River runs along the bottom, and hikers will enjoy waterfalls, sheer walls, and rock formations. “Grand Canyon of the East” is what Gulf Hagas is often called because it offers hikers some fabulous views. Gulf Hagas is located in an area of land managed by the North Maine Woods Group. You will also find an area up here called Screw Auger Falls. You can also proceed north on the Applachian Trail toward Whitcap Mountain. Circuit route is 8.2 miles. Elevation gain is 600 ft. This mountain rises dramatically from the middle of Moosehead Lake. Mt. Kineo, with 700-foot (210 m) cliffs rising straight up from the water, is a dramatic setting that has attracted visitors for centuries. There are magnificent views from the summit. Shorter branch of the trail is called Indian and ascends among cliffs. Bridle Trail is longer with no views and easier grades. Dock to summit is 1 or 2 miles. Elevation gain is 800 feet.